Razer’s Huntsman Elite is the company’s first keyboard to use optical switches instead of the traditional mechanical switches it has been using for years. The idea is that by using light sensors inside each switch, as opposed to physical connections, the switches can be more responsive and faster. Imagine a bunch of laser beams firing off under every key on your board… mmm, the future. 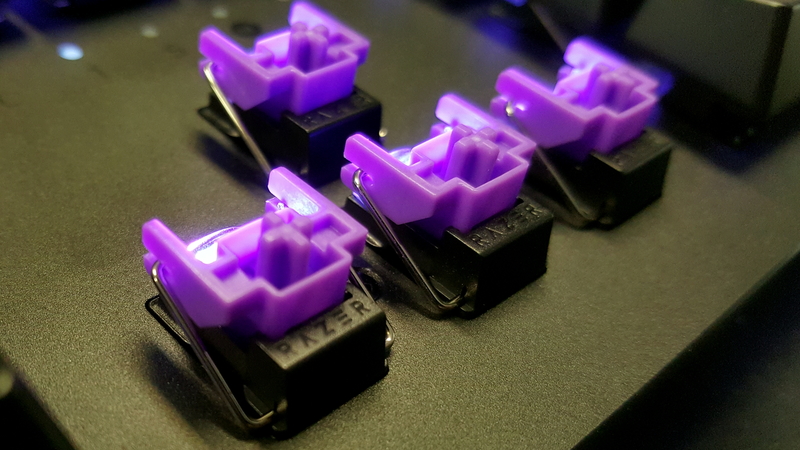 But this isn’t the first time we’ve seen optical switches being used in a gaming keyboard, though it’s the first time a major PC peripheral maker has gone to the effort of using one, let alone creating their very own design of switch. It’s not necessarily taking advantage of the optical technology in the same way as the excellent Wooting One keyboard we love so well, however. 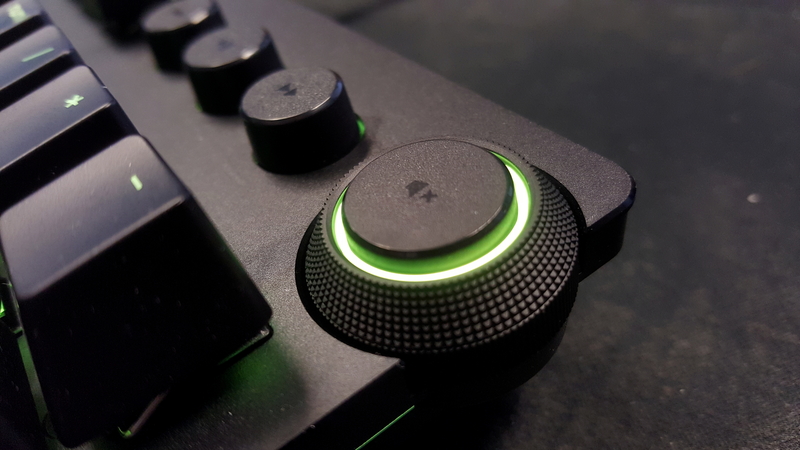 Wooting didn’t create its own switches but used Flaretech’s optical option, which allowed it to not only have the speedy actuation that Razer is touting here but also gave it an analog style input. That and it didn’t have to sink a bunch of cash into switch R&D. Losing out on that option seems like a bit of a miss with the Huntsman Elite; a high-priced mechanical gaming keyboard that is itself looking to change the game, and means it doesn’t quite have the same level of functionality. Instead Razer’s Opto-Mechanical switches simply use the light actuation to indicate whether a key has been pressed in a binary, off/on situation. It feels a waste when it could go all out making a real statement with a fully analog board. But that is not what Razer has been going for with the Huntsman Elite. 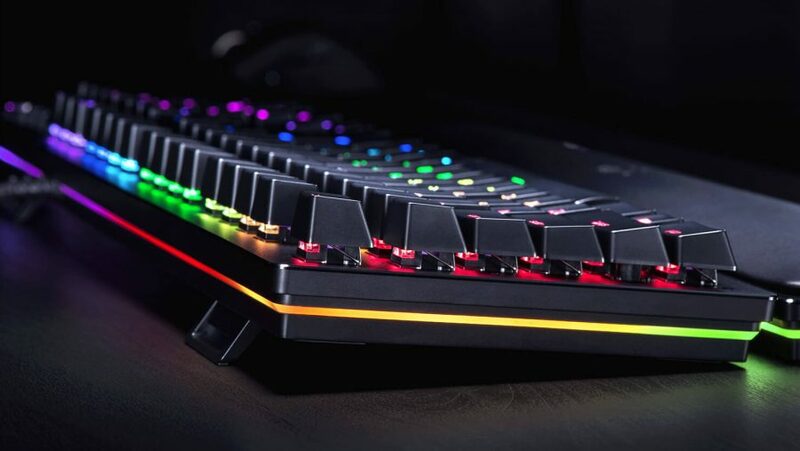 This is a gaming keyboard that’s all about quick actuation and a lightweight action. Oh, and clickiness. It’s so clicky. Thought that’s not necessarily down to the fact that every individual key on the board has a metal bar through it. When we first saw the design of the switch we, wrongly as it turns out, assumed that would make it super-loud. Instead it’s only about the same as the already-pretty-noisy Flaretech design. Though, interestingly, it doesn’t have the double click most Cherry MX Blue-like switches do. 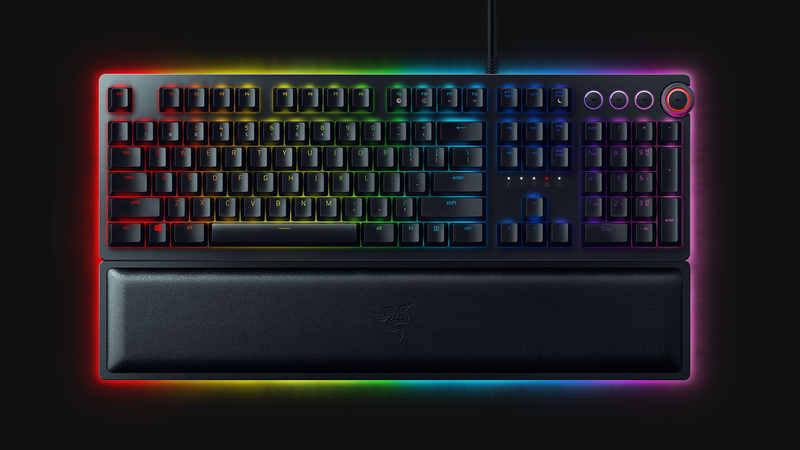 Those have a deliberate click on the way down and then on the way back up, while the Razer Opto-Mechanical switches only have a single physical click. The secondary noise you might hear comes from those metal bars pushing the switch back up again. It’s all about that actuation point, though, and that’s where Razer’s new design is quicker than a standard Cherry MX switch. The actuation of the new Opto-Mechanical sits at 1.5mm, while a standard clicky switch is around 2.2mm. Of course the MX Speed is around 1.2mm, but Razer will argue that’s a linear switch, and it is chasing the performance of a linear switch without sacrificing tactility. In fact that’s exactly what it says on the Razer switch’s minisite. Personally I’m not a massive fan of tactile switches, they always feel a touch gritty for my tastes, like I’ve pulled my keyboard out of a dirt-filled dumpster, but I do get I’m to be in the minority of people who feel that way. Apparently a lot people like that crunchy, tactile thing. Weirdos like our Jacob. Gross. The issue is that Flaretech’s clicky optical switch also has a 1.5mm actuation point as a minimum, and Razer’s talk of an almost instantaneous reset is also matched by the analog switch used in the Wooting. With a 0.03ms debounce you’re not exactly going to be waiting around for it. So, it’s not like the performance you’re getting with Razer’s new Opto-Mechanical switch is really anything new, and it doesn’t deliver the same level of functionality as other optical-powered boards either. But it is still a very good switch; it feels solid and the action is quick and responsive too. It’s not exactly groundbreaking, but Razer has done a good job in creating a clicky, speedy switch off its own back. The way it’s been designed also lends itself to bright LED backlighting too. The Cherry design shrouds the LED, while Razer’s setup give the light space to luminate. The Huntsman Elite also a rather well-appointed board too – which it should be given its rather wallet-straining $200 (£160) price point. It’s rocking discrete media keys, macro support, and a gaming mode (sans Windows key) as well. There’s also a separate volume wheel situated on the side of the board, though it’s a little counterintuitive given that you have to wheel it up to make things quieter and down to make them loud. While I’m talking design quirks I’m also less than enthused by any gaming keyboard that still uses retractable feet that face backwards. Placing them sideways means that as you inevitably shift your board around your desktop the feet don’t fold up under the pressure. Maybe it’s just me, but having to continually fiddle around under the Huntsman to pull out its feet began to really grate on me while I was testing. But what it does have is one of the nicest wrist rests in PC gaming. Razer kicked off the plushy rest for us when it shipped the latest Blackwidow keyboards, and Logitech quickly followed suit. The Huntsman Elite, however, goes a step further and offers a magnetic attachment that also provides the necessary connections to enable its RGB goodness. 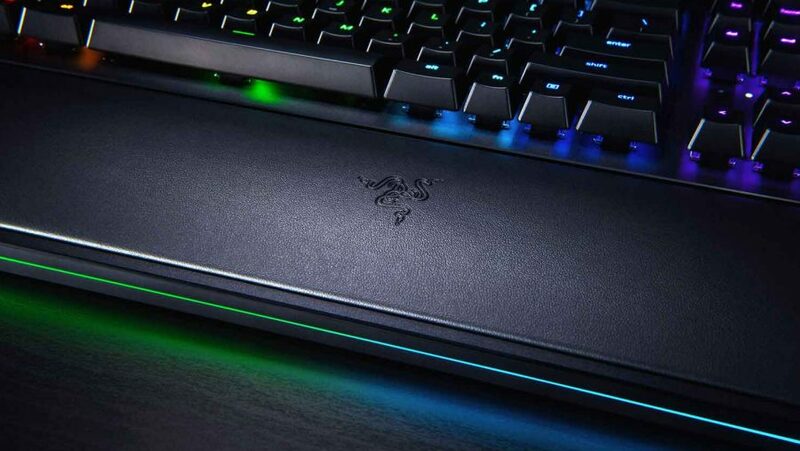 Yes, Razer is introducing the RGB wrist rest. Gawd luv ‘em. Unfortunately when you’re actually using the board you won’t ever see the line of illumination around it. The whole RGB setup is controlled from within the Razer Synapse software, allowing you to have multiple lighting zones and effects going at the same time. All very exciting, I’m sure you’ll agree. While you can obviously have it lit up like a close encounter of the third kind finale, dialing back the LED gaucheness actually leads to a rather restrained design. The simple right-angled lines of the Huntsman make it feel like a quite grown-up keyboard. Though I could have done with a little more clarity around the media keys and the indicator lights. In low light it’s almost impossible to see whether you’re pausing or skipping a track, or what the hell that little white led indicator is, well… indicating. The Huntsman Elite, however, is a good gaming keyboard, but I can’t help but feel a little frustrated by it. It feels rather like a missed opportunity because it could have been a great gaming keyboard. And when you’re paying $200 for a board you want it to be great. Its minor design quirks are mildly annoying, but the fact that Razer has used optical switch technology only for the speed – which you can largely still achieve with regular linear mechanical switches – and not taken advantage of the other potential features make me feel a little sad for what might have been. A good gaming keyboard that could have been great if it used the optical technology to its fullest... and wasn't so frighteningly expensive. The Huntsman’s Opto-Mechanical switches are speedy, clicky, and responsive, but not really delivering anything new.